This sounds like a lot of garlic, but it becomes so sweet and mellow with baking that you may well wish there were more! 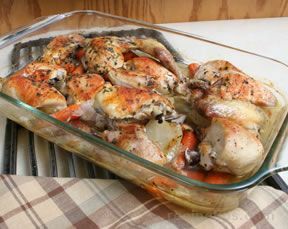 Salt and pepper chicken and arrange in an oven-proof pan or dish in a single layer. Take a thin slice off the top of each garlic head, but do not separate into individual cloves. 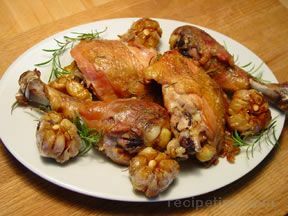 Brush cut tops with oil and tuck garlic heads in around chicken pieces. Pour wine over the chicken. Arrange rosemary on top. Cover with lid or foil and bake for 45 minutes. 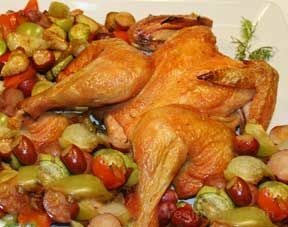 Remove cover and continue to bake until chicken is very tender and most of the liquid has evaporated, 15 - 30 minutes more. Add water, if pan is dry or nearly dry. 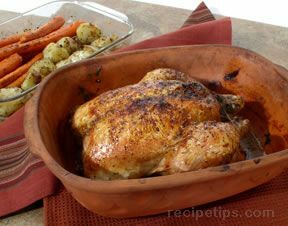 Serve hot with pan juices spooned over and garlic heads on the side, so each diner can squeeze garlic pulp onto chicken. Good with rice, polenta or mashed potatoes.